But organic isn’t necessarily synonymous with pesticide free. The USDA report says some organic lettuce tested contained pesticides. 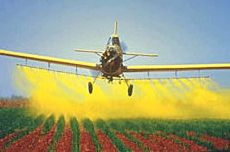 The most common residues were from spinosad (found in 18 percent of samples) and azadirachtin A/B, which USDA says are OK for use in organic agriculture. And the USDA says less than one-third of 1 percent of the food samples it tested contained pesticide residues that exceeded safety tolerances established by the Environmental Protection Agency. Nearly three percent of the foods sampled contained pesticides for which the EPA hasn’t set standards, USDA said.